Around the world, the damage done through the economic and budgetary crisis of the last decade is still being felt by the most vulnerable. In Ireland, the economy has made an impressive recovery, growing at least twice as fast as its European counterparts, but almost 800,000 people are still living in poverty. This is a key issue for Social Justice Ireland (SJI), an independent think tank and justice advocacy organization that works to advance the lives of people and communities through independent social analysis and policy development. At a recent meeting of European civil society organizations engaged in budget work, SJI CEO Dr. Seán Healy discussed how the organization uses research and policy advocacy to inform budget debates, including the group’s use of Alternative Budgets – policy briefs that incorporate alternatives to the government’s budget proposals meant to encourage the government to make budget choices that are both economically sound and socially fair. SJI releases an Alternative Budget policy briefing each year at the beginning of the government’s budget process which outlines specific policy outcomes that are informed, in part, by its work with local organizations on the ground. The Alternative Budget also informs SJI’s analysis and response to the government’s budget, which it produces hours after the budget’s release. 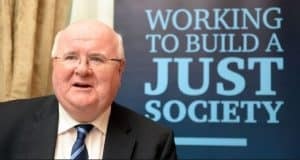 SJI’s most recent alternative budget policy briefing, Budget Choices 2019 (released 5 June 2018), outlines how Ireland’s current challenges, such as social housing, unemployment, rural development, healthcare, and childcare could be addressed via the national budget by raising the tax take to fund a fairer society without becoming a high-tax economy. SJI’s Budget 2019 Analysis & Response (released 10 October 2018) details whether the budget adequately addressed these social challenges. We recently spoke with Dr. Healy about SJI’s use of alternative budgets in its social justice advocacy. IBP: You started with the church and then followed a different career path. What inspired this move? SH: I worked over a decade in Africa and through most of that time I worked in social development and social justice programs. At the same time I was pastor of a parish. Then I did a Masters and a Ph.D. at Fordham, and then came back to Ireland and worked on the justice end of issues for over 25 years with the Conference of Religious of Ireland. SJI was established 10 years ago as a stand-alone, independent organization – independent of the religious congregation. Anybody can join it – we have hundreds of organization and individual members. The only requirement is that members are interested in the development of a just society. You are correct in saying that I started with the church. However, I haven’t left the church – the Society of which I am a member (SMA which has members in many countries in the world including the United States and Canada) supports me in the work I do and supports SJI as well. The work I do on budgets and on a wide range of other issues such as the UN Sustainable Development Goals are also priorities for the church and the SMA. IBP: SJI started with a broad agenda, how did you arrive at budgets? SH: Budgets became an issue for us (Dr. Healy and his SJI co-director, Sr. Brigid Reynolds, while working with the Justice Commission of the Conference of Religious in Ireland) early on. One of the things I was made aware of in my time in Africa was government budgets had a large impact on what happened and what didn’t happen. Government had resources, they could spend them one way or another, and how they spent them decided who benefited or who didn’t. When we started focusing on the government’s annual budget (in 1988), it was at the end of a very difficult period in Ireland and there was a lot of claims by government that resources were relatively scarce and there wasn’t an awful lot that could be done for vulnerable people. That was something that we disputed. We basically said that budgets, where government are concerned, are a question of choices, and your choices are governed by your view of the world, and your values, and what you consider to be a right, and where you want to go. IBP: How did the concept of alternative budgets come to fruition? That’s when we decided to produce an alternative budget, fully costed, that had the same outcome exactly – but that would be much better for vulnerable people than what had actually been happening in the previous years. IBP: What are some of the fundamental differences between SJI’s alternative budget vs. the government’s budget? What did you quickly identify as the fundamental things that were preventing resources from reaching vulnerable people? SH: The government kept focusing on reducing taxation, and our view was that Ireland is a low tax country, and that, no, we’re not suggesting Ireland should become a high tax country, but that taxes shouldn’t be lowered any further. We did a fair bit of work showing that Ireland’s taxation to GDP ratios were very low by comparison with other OECD (Organisation for Economic Co-operation and Development) countries. We also focused on areas of infrastructure that were being neglected – we showed that social housing was being hugely neglected during the bailout years, and we pointed out very clearly that Ireland was going to have a serious housing problem within a short number of years and that has come to pass. And Ireland now has thousands of homeless people in a society that didn’t have a homeless problem in the past. The number of houses/apartments in the country are far below what is required to meet the demand. So, the price (rent, purchase price) has been rising to ridiculous levels and are now far beyond the capacity of large swathes of the population to pay. We argued that the same outcomes in reduced expenditure could be achieved but with far lower negative impact on employment levels. We opposed the austerity focus of the Troika and the government and challenged its basis. Most economists of note in the world today agree that the arguments supporting the austerity at that time were bogus. So that’s the space we’re in today, very much a direct result of the sort of infrastructure deficit that we ran up after the fiscal crisis in the late 1980s, exacerbated by the policies that were followed by government through the years after the 2008 crash. IBP: How do you go about influencing civil servants, governments, in general, to change their way of thinking? SH: Government budgets are all about governments making decisions about resources. There are three components that are essential to look at in the decision making process: there’s an analysis of the present, and there’s a vision of the future, and there is a whole series of ideas about how to get from that present to that future. With the budget, government is deciding to allocate resources on the basis of its analysis of the present, and its vision of the future. We do a lot of social analysis which informs much of the budget work that we do. The alternative budget is very focused on improving people’s analysis of the situation as it is. Then we try to improve their vision of the future. The alternative budget shows how our proposals are do-able in initiatives and programs, how they can be paid for, and what they will cost without breaking the bank. We target all of that material at different audiences. We have good access to government ministers and government in general, we have good access to civil servants, we have good access to employers, trade unions, farming organizations, environmental organizations and so on. We also talk to civil society organizations and make a lot of material available for them if they think it’s useful. We also try to engage with media. National and local. And we’re relatively effective in that we have a very high profile and that we’re well-known. We’re seen as tough on government and tough on whoever’s in power but we are seen as being tough on everybody. We’re seen as being fair. We target local radio, local newspapers, national radio and television, and national newspapers. We get fairly good coverage, and if we had more resources we’d be able to cover more. We also engage with a lot of local and national organizations and provide them with resources and training so that they can actually advocate themselves. We’re always picking up ideas of what should be in the budget, context or whatever, through those engagements. Dr. Seán Healy is an Irishman and CEO of the think-tank and justice advocacy organization Social Justice Ireland. For more than 25 years, he has been active on issues of socio-economic policy and with his co-director Brigid Reynolds, he has written or edited more than 40 books on public policy. Their most recent book is Social Justice Matters, published April 2018.